Repair My Flute: Felt or Straubinger? Rachel told us that the pads each have different characteristics based on their composition. In terms of feel, the materials create a noticeable difference because the pads will hit the cups differently when you play. The felt has more give and can handle extra upward pressure (exerted on the pad when you close the key cup), so she said they tend to be better for people with "heavier" hands. The Straubinger pads have a crisper response than the felt, so someone with a lighter touch may prefer these. 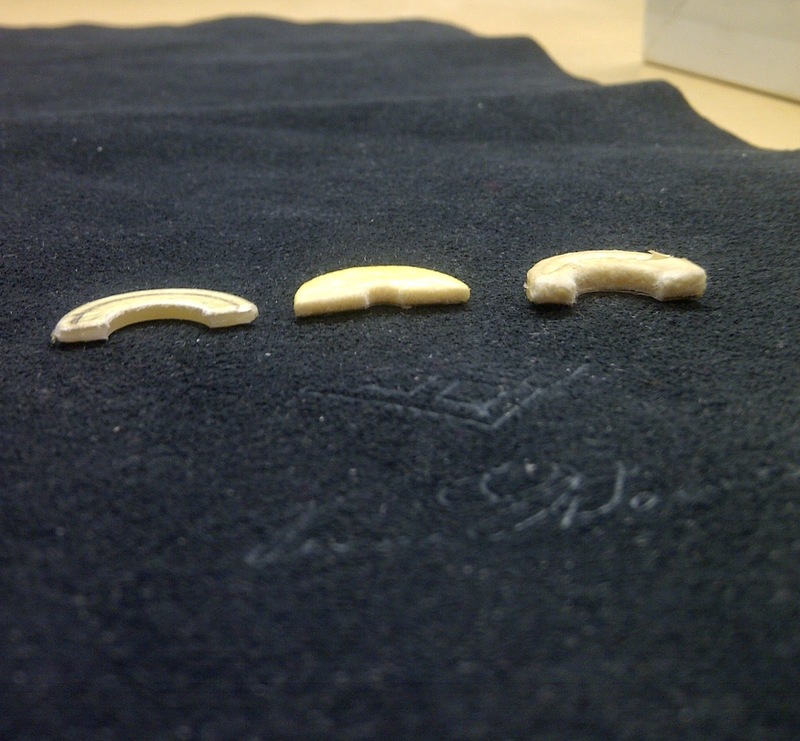 The Straubinger pads also tend to have more stability because they are made from synthetic materials. The natural materials in the felt pads fluctuate more with changes in atmospheric conditions, so, for instance, a flutist living in a very humid climate would probably not have as much luck with the felt pads because of the humidity. In terms of sound, one might not realize, but there is a difference. Rachel said that one pad is not better than the other -- it just all depends on the player's sound preferences. If you think about the physics behind sound production on the flute, as air travels through the instrument, there will be a difference in sound because of the difference in materials (felt or synthetic pads) closing the tone holes. Sound discrepancies may be difficult to describe, but some players may note general color/quality differences such as a "brighter" or "darker" sound, depending on their choice of pads. 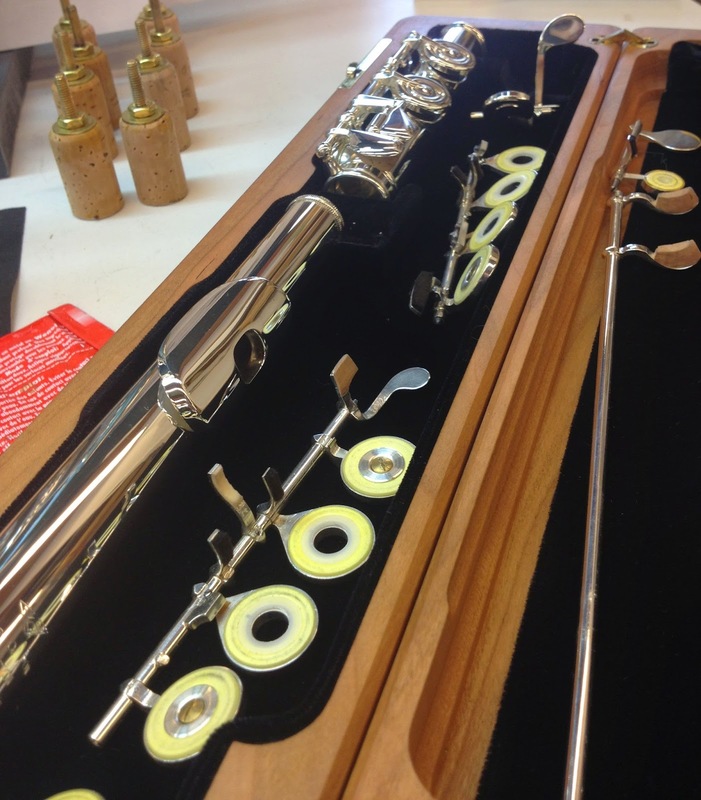 Signature flute with Straubinger pads in for a COA. When speaking with customers, Rachel said that she asks several questions to determine what type of pad might be best for them. First, she asks what type of pads are currently on the flute. Many flutists may not know which type of pads they have, but that is okay. Rachel will continue with more questions about the type of playing the flutist does, where they live, what type of sound they prefer, and any issues they may be having with the flute. For instance, we noted in the previous paragraph that someone living in a humid climate might have problems with felt. When it comes to type of playing, she asks, "Do you play outdoors or indoors? Marching band? Concert band or orchestra?" Then, she asks about their preferences and any issues, "Is the sound too bright? Too dark? Not projecting enough?" These questions help her get a sense of the flutist's preferences and also help paint a picture of the performance environment the flute will have with each customer.